The Energy Combi 30kW gas boiler has been designed and manufactured by Glow-worm. It is a condensing, wall mounted Combi boiler which means it is a great choice for smaller properties where space is limited. This is because they do not require an external water tank or hot water cylinder. Everything is wrapped up in one cost effective unit as it takes its water supply directly from the mains and heats water on demand. This boiler is A rated boasting an efficiency rating of 89.2%. The 30 kW output makes this unit perfect for those medium sized homes which don't have an excessive need for hot water. It is so compact in size it can be installed in a kitchen cupboard which will helping to keep it hidden out of sight. It also has rear flue options. 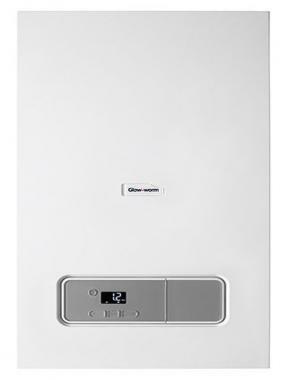 This boiler has a modern design with a bright, easy to use interface and a wide choice of controls helping to give you maximum control over the unit. This boiler is also available in outputs of 25kW or 35kW so you can be sure there'll be a unit to suit your home.